God's gift to Simeon was truly precious and touching. Yet Simeon is just the embodiment of all of every nation, race, and culture who are seeking God's salvation. 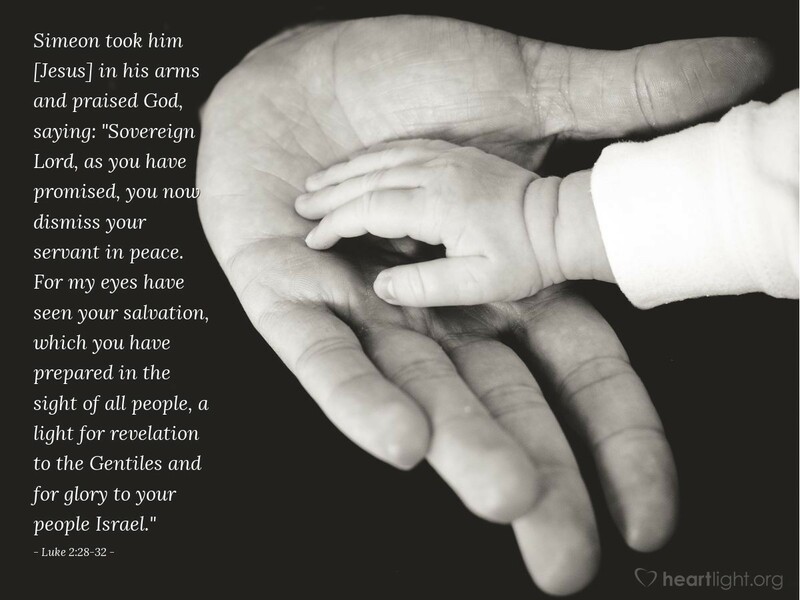 God's salvation, as Luke loves to remind us again and again, is for all people! What's more, God's light has dawned. Let's greet that dawn and share it with others. Lord God of all nations, not only do I pray for peace on our earth, but I pray that the knowledge of Jesus may be spread to every nation this coming year. Please make me more sensitive to those around me who need your grace. Give me courage and the right words to say to open their eyes to your salvation. Stir me to be generous with those who are spreading your Gospel throughout the world. Bind the work of Satan. Prevent the evil one from keeping whole nations in darkness. Please use me to help make a way for grace to bring your salvation to their darkness. Make your Kingdom triumph through the triumph of your grace throughout the world. In Jesus' name, I pray. Amen.